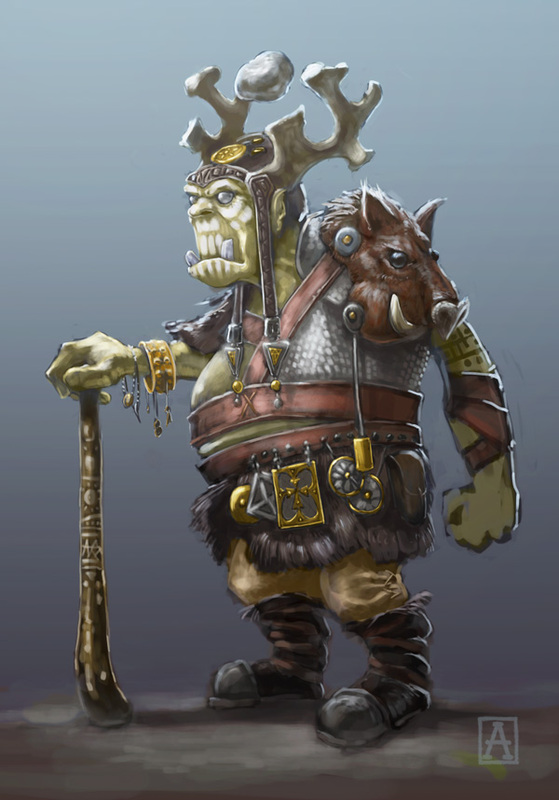 An orc shaman that I'd been noodling around with. I had a lot of fun on the outfit for this guy, what with the antlers and boar's head spaulder. I also wanted to give him an offbeat weapon, rather than the de rigeur staff. From what I understand, it takes a lot of skill and finesse to properly manage a staff, and I figured any self-respecting orc would want something a little more visceral. Hence the shillelagh. He also wears the rondels of fallen foes on his belt, and has some weird levitating mystical rock always hovering over his head. What's up. 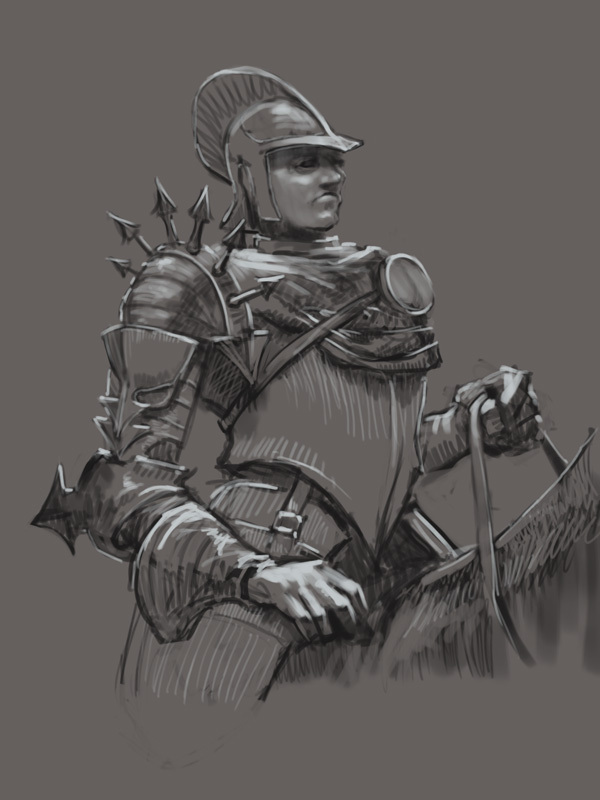 Quick sketch of a cavalry officer in Photoshop. About an hour and a half. I started by using a toned background, then laid out some general shapes on a new layer. When I was ready to commit more fully, I reduced the opacity of that layer to about 15%, then set up a new layer for black lines on top. When I was ready for highlights, a created another Solid Color layer (bluish white) and handled it the same way. All my drawing layers were done in Solid Color adjustment layers: pick a color for the Solid Color layer that you want your lines to be (nearly black, in this case) and then fill the mask with black, making that color disappear. Now when you draw on the mask with white, you produce black lines. I've got my stylus set up to switch colors when I press the button, so this works well for me: I just draw using white, then toggle to black when I need to erase. No fumbling around with the stylus or the keyboard. 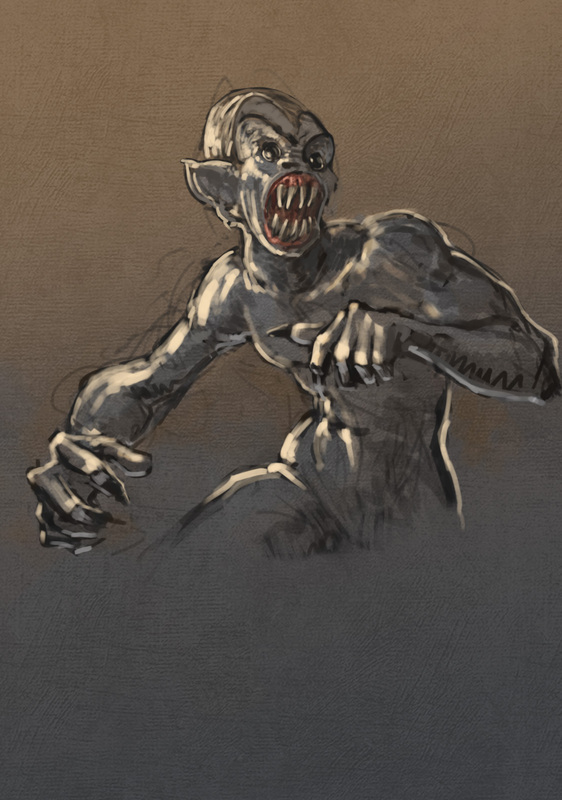 I stayed up a bit later and did this guy, starting the same way as above, then adding color slowly, trying to retain the textures beneath. Here's the latest in a series of character commissions I've put together. Enjoy!